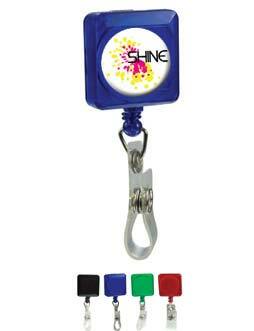 Inexpensive Personalized Retractable Badge Holders in Bulk, Domed, Custom Printed in Full Color. Guaranteed lowest cost in USA and Canada. 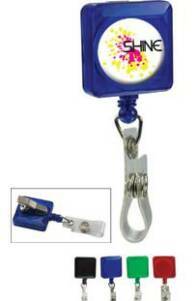 High quality, yet inexpensive Domed Retractable Badge Holders in bulk, customized with you logo in full color (unlimited number of imprint colors or a picture). 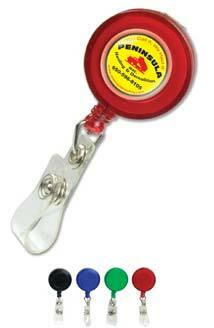 We also supply blank (not personalized) Domed Retractable Badge Holders for $0.71 each. Free artwork design and Free proofs! American clients pay no taxes. The unit prices below include your full color custom imprint on one side. 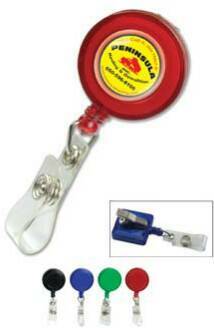 We also supply blank (not personalized) bulk Domed Retractable Badge Holder for 0.71 each (minimum quantity: 200). Available Colors of all items: Black, Translucent Blue, Translucent Red, Translucent Green. OPTION: Individual Poly Bagging: $0.05 per unit (necessary to minimize scuffing).